Yesterday, we told you about the strange-but-true tale of Jim Bartek, an Ohio Judas Priest superfan who has listened to the band's mega-opus Nostradamus every day since its release. Bartek's incredible feat paid off handsomely Tuesday night when he sat in the third row (gratis) for the band's concert in Cleveland. But Bartek got much more than free tickets. That's right - he actually got to meet Judas Priest backstage to talk about the album that has consumed his life for 396 days and counting. "It was probably the greatest night of my life," Bartek told MusicRadar. "Before the show I was taken backstage and I met with [guitarist] KK Downing and [bassist] Ian Hill. "They were so nice to me. They really appreciated all the support and said that they've heard a lot of people are picking up on the record now because of my daily listening habit." Adds Bartek with a laugh, "And then [guitarist] Glenn Tipton came up to me, gave me a back on the back and said, 'Awesome work, man! How'd you do it?' I don't think he's even listened to the record that much." 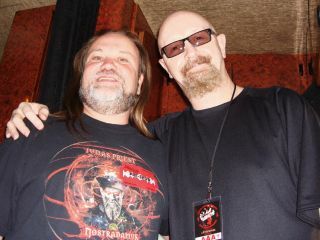 The crowning moment of the night came next, when Bartek had a private audience with singer Rob Halford. "That was the coolest thing ever!" Bartek raves. "Rob was such a gentleman and he was sincerely appreciative of my dedication. "We spent probably 15 minutes together talking about Nostradamus, not just the album, but the man himself. I told Rob that because of the record I'd been doing a lot of research and that the experience has been very educational." Although Judas Priest played only one song (Prophecy) from Jim's treasured double-CD, he wasn't bummed: Halford hinted that Priest was planning a 2010 tour in which they would perform Nostradamus in its entirety. "I'll be front row for that," says Bartek. "Even if I have to pay for tickets." It should be noted that MusicRadar was supposed to speak with Bartek last night to talk about the concert, but the superfan (who has been known to don the garb of the 16th century French prophet, see photo below) had a date with his dog, Clarence, to listen to - what else? - Nostradamus. So the conversation was held just minutes ago before Jim left for work. "I couldn't miss a night without listening to the record," Bartek says, "If I did, I'd feel really sad, and so would Clarence. He likes Nostradamus as much as I do."